Birthstones have existed across cultures throughout history. Often, these are attributed to significant aspects of a particular society, such as religion or custom. Modern times reflect these themes as well, as groups have updated these symbolic stones to reflect current tastes, thoughts, and trends. Join us as we examine the nature of the October birthstones. Modern times reflect these themes as well, as groups have updated these symbolic stones to reflect current tastes, thoughts, and trends. Join us as we examine the nature of the October birthstone. 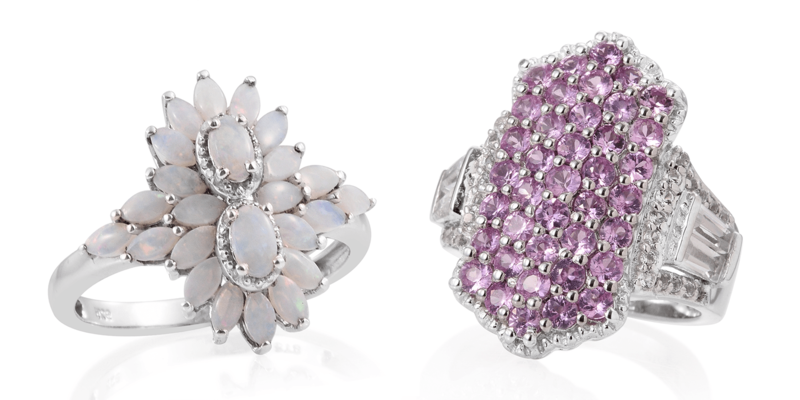 Opal and tourmaline are the modern birthstones for October. Either gemstone should be considered a treat! Both are available in an incredible selection, providing tantalizing options for those fortunate enough to be born in this month. 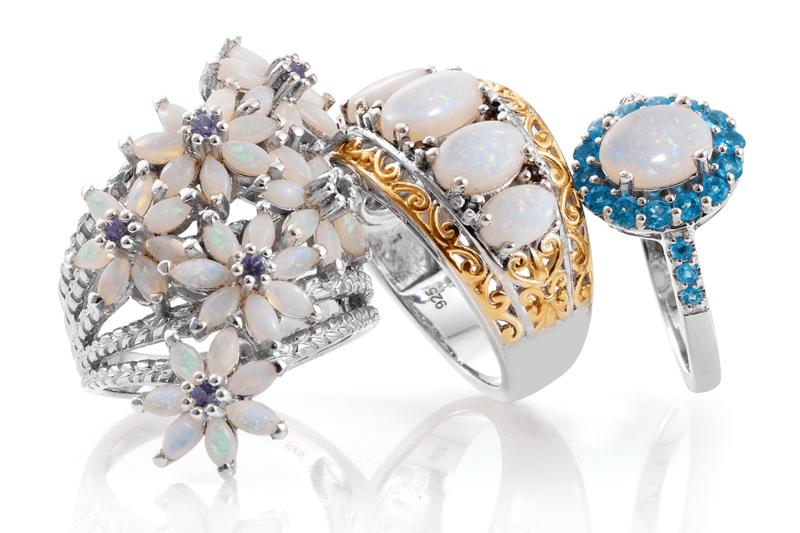 Traditionally, opal is renowned for the quality of its play-of-color. The name opal originates from the Roman word “opalus” which traces its roots from the Greek’s “opallios” meaning to see a change of color. This Greek word is likewise a revision of the ancient Indian Sanskrit’s “upala” which means precious stone. These stones display an incredible play of light across their surface, as they enchant with the myriad of colors they can display. Also known as “Queen of Gems,” no two opals are alike. Factors that determine the value of an opal include type, brilliance, body tone, transparency, pattern, and shape. Categorized as per their body colors, there are various varieties of opal with distinct characteristics. Where opal is an attractive choice for an introvert, tourmaline is a great option for those with colorful, outspoken personalities! Like Opal, tourmaline is found in a dizzying selection. However, the available colors are more vibrant and bold, useful in any situation where a statement must be made. Paraiba tourmaline is perhaps the most famous example of this stone, possessing an electric blue to green color. Even stones that are black in color stand out with vibrant, vitreous luster, such as material from Australia. Opal has been traditionally associated with October since at least the 15th century. Tourmaline, however, was selected as an October birthstone in the early 1900s. Before this, Aquamarine (a variety of beryl) was associated with the month. In modern times, however, aquamarine became the modern birthstone for March. Famous for its color, the best specimens of aquamarine show the depth of fresh blue seawater. As with many stones, this saturation tends to rise as the size of the stone grows larger. If blue isn’t your color, then Scorpios are in luck! With Beryl as their birthstone, they find themselves in luxurious company. Lush, green emerald, and soft, pink morganite, alongside aquamarine, are all counted as examples of beryl. Traditionally, Libra is assigned chrysolite. From a historical perspective, this jewel was known for its intense green color. However, in modern gemology, chrysolite is not recognized. Scholars and experts have long debated on what stone or stones were considered to be chrysolite. Before our current understanding of gems, fewer gemstones were identified, as most were known only by their color. In the end, most agree that references to chrysolite are referring to peridot. In the end, it matches most historical accounts of this gemstone. Opal and tourmaline are considered the modern U.S. birthstones. The United Kingdom recognizes opal as a birthstone, but not tourmaline. Libra (9/23-10/23) utilizes chrysolite as their stone. Scorpio (10/24-11/21) is assigned beryl as a birthstone. Aquamarine is a historic October birthstone.